Marigold Montessori is best described as the kind of day care centre you’d expect to find in a small village, only in a convenient downtown Whitby location. Standing at the entrance to the centre at the back of the church, it’s hard to believe that you’re even close to the bustle of downtown Whitby. The fenced-in yard is covered in neatly trimmed grass, away from the main street. Inside, there’s a small but dedicated staff who work closely together and run a variety of concerts throughout the year for parents and children to enjoy. A few of the staff members that I met on my tour had been working at this location for more than seven years. 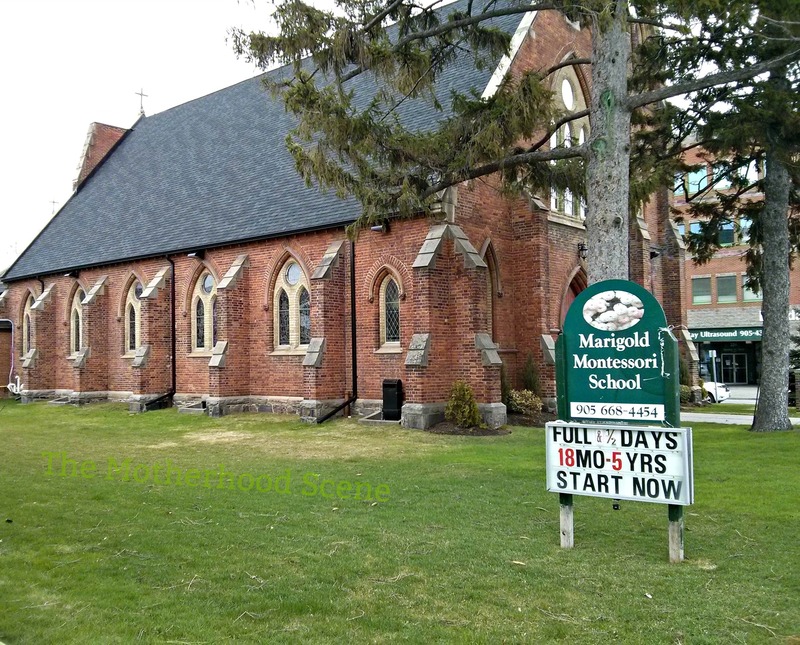 Marigold Montessori is located in the All Saints Anglican Church on Dundas Street. You’ll find the entrance at the back of the church, next to the area for parking and the yard. This entrance connects to stairs that will take you down to the basement level of the church where the centre is located. Once you arrive, the pride of ownership is immediate. The facility is immaculate. At no point in any tour was I expecting to see perfection in the way a centre is kept clean. If I was, this would be the place to beat. All Montessori learning materials are neatly stacked on shelves and not once did I ever see a dusty corner or shelf. What I like about this centre is that children are exposed to music, French and sign language programs in addition to their regular classroom schedule. I spoke to the sign language program instructor and without my asking, she made a comment that the children at this facility were among the best behaved that she’s ever worked with. I would never have believed it if I didn’t see it with my own eyes. The energy here is a lot more subdued and mature than other centers that I’ve visited, with an even mix of children of all ages up to five. If your child thrives in a structured and personal environment, this option could be the one for you. Accepting children from 18 months onwards. Part time and full time care available. Parking is easy to access with more than 8 spaces available. Fees start at $330 per month for three half days per week and goes up to $1,000 per month for five full days (for children starting at age 18 months in the Pre-Casa program). Full days begin at 9am and end at 3.30pm. Additional time between 7-9am and 3.30-6pm is billed in 15 minute increments at a fee of $2.50. Registration is $50 and is non-refundable.